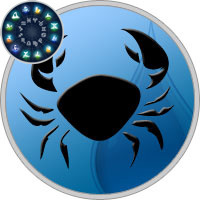 As a Cancer born on July 10th, you are a creature surrounded by great sensitivity, but also great mystery. Overtly private, you choose to keep your emotions and thoughts to yourself if possible, as you attempt to be a closed book to others. This even applies to your close friends and family, who often to struggle to figure you out. Alternately, you find it quite easy to read the feelings and thoughts of others and as a result are both sympathetic and compassionate. Water is the paired element of your sign, and in fact, you have a more fundamental connection with water than any other zodiac sign. As though overcome by strong waves, you often experience emotions very deeply. From these experiences you gain a valuable understanding, that you then use to read the changing waves that effect others. These positive qualities of water are one of your greatest strengths. Be careful to avoid becoming fully submerged in the emotional qualities of water, as you run the risk of moodiness and emotional instability. Your sign is ruled by the moon, but because you are born in the second Decan, or part, of the sign, you also experience the planetary influence of Pluto. The influence of the moon is reflected in your sensitivity and the intuitive, almost psychic-like, way you deal with emotions. Pluto’s influence is quite different by comparison and focuses on power and control. This unique combination explains why you are far less emotionally dominated than other Cancers, as you fight to keep your practical side in control. While you keep most people at a distance, in your close, loving relationships you let down your walls somewhat. You feel secure when in a committed, loyal relationship and should strive to find this situation. Though close relationships will greatly satisfy you, make sure to not let jealousy appear, as it is a common product of your planetary influence.